Fleece fabric never frays and is easy to work with, so it's the perfect choice for this kid-friendly project. Expect to spend about an hour making your sleeping bag. You can choose from a single-layered sleeping bag or a warmer, double-layered design. Either way you get to pick the colors and patterns for the fabric, giving you unlimited options to personalize your creation. Younger kids will need assistance with this project, since it requires a lot of cutting. Start by deciding on the size of your sleeping bag. Measure the height of the child and add twelve inches to determine the length. For width, 26 inches is a good size for most kids, although you can adjust it as desired. Your fleece piece will need to be the length you decided and 60 inches wide, based on the 26-inch measurement. Make sure all the corners are square and that the sides are cut neatly. If you'll be making a double-layered bag, cut another piece of fleece exactly the same size. Spread the fleece out on your work surface. If you're making a double-layered sleeping bag, stack the second piece of fleece on top. Fold the fleece in half to create the bag. You'll want the side that matches your length measurement to be straight, while the 60-inch side is folded in half. Use safety pins to neatly secure the fabric so it won't move while you're cutting. Measure four inches in from the edge on the long side of the sleeping bag, and run a piece of painter's tape up this edge. You may have to measure in several places to make sure it's straight. Repeat with the top and bottom of the sleeping bag. You'll now have painter's tape lines on three sides, and the fourth side is folded. Use your scissors to cut through all the layers of fabric along the edge to create a fringe. Cut every one inch and stop when you reach the painter's tape. As you work, make sure you keep the fabric stacked neatly. 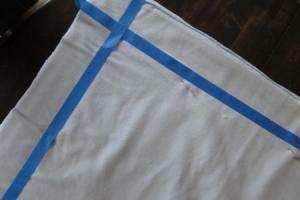 When you get to the corner, you'll remove a square of fleece bordered by the tape. This square will be four inches by four inches, and the fringe will continue on each side of it. This keeps your sleeping bag from being too bulky at the corners. 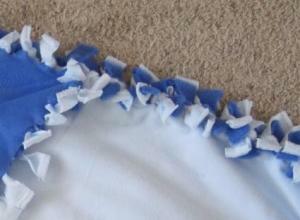 Starting at the bottom corner, next to the folded side, tie all of the layers of the fleece fringe together in a knot. Then tie the next piece of fringe. Continue around the corner, tying the pieces together to join the fabric layers. Stop when you are about one third of the way up the long side. At this point, switch so you are tying the fringe but not closing the bag. In single-layered sleeping bags, you'll just be tying one layer of fringe. In double-layered bags, there will be two layers of fabric in each knot. Continue this process up the long side and around the corner at the top. Stop when all the fringe is knotted. Your bag is done! Tie all four sides of the sleeping bag, rather than folding it, if you want a wider bag. Most fleece fabric is 60 inches wide, so you'll need twice as much fabric for this style. Use hot glue to attach embellishments to your sleeping bag. You can add flowers, patches, and other fun decorations. For a complete set, make a no sew pillow to match your sleeping bag. 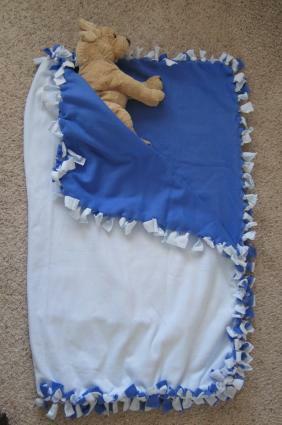 Make a miniature version of this sleeping bag for a favorite doll or stuffed animal. You'll love expressing your creativity with this easy project. Your kid-sized sleeping bag will be unique, since you can choose the fleece fabric and the design. Take your time and make sure each cut is careful and neat, and you'll end up with a sleeping bag you'll be proud to show off to friends.